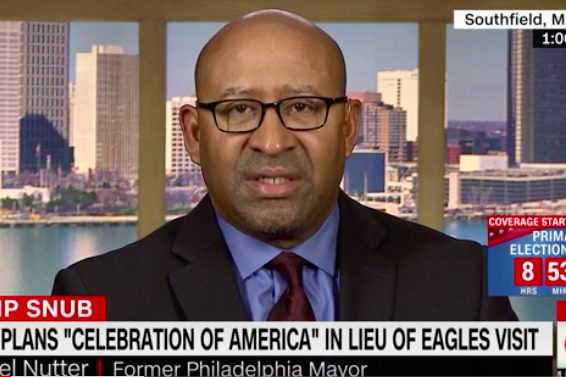 Former Mayor Michael Nutter appeared on CNN on Tuesday afternoon to defend the Philadelphia Eagles' decision to opt out of a White House visit. The story of the Philadelphia Eagles versus President Donald Trump has pretty much dominated news cycles this week here in Philly. If you haven't heard: Many of the Eagles opted out of the customary White House visit to meet the president as Super Bowl champs. And then Trump rescinded his invitation, saying it was a disappointment to Eagles' fans and attendees. We're all chiming in on the controversy, even former Mayor Michael Nutter. "There's no embarrassment to the Philadelphia Eagles," Nutter said on CNN Tuesday afternoon. "The players have conducted themselves with dignity and grace and patriotism." He also noted that — contrary to what the president tweeted on Tuesday — none of the Eagles took a knee during the national anthem this season, nor did they wait in the locker room in protest. "The players are talking about real issues and using their voice and their position," he said. "They're not going to be told where to be, where to stand. He doesn't get to dictate a Trumputian dictatorship that he's trying to create to tell people what patriotism is." You can watch his entire monologue below. Nutter also gave credit to players Malcolm Jenkins and Chris Long for their leadership on the "real issues," both of whom have been outspoken activists on social justice issues. On Wednesday afternoon Jenkins took a silent stand in the Eagles locker room, holding up signs in protest. Nutter added that President Trump "refuses" to acknowledge issues like police brutality and racism and only wants "photo ops and to play politics." "We're proud of the Philadelphia Eagles, we're proud they won the Super Bowl," he added. "I acknowledge and herald the players, Jeff Lowry, Couch Doug [Pederson] and the entire Philadelphia organization. We had our parade, we had our celebration. He canceled on them because apparently crowd size still matters to Donald Trump."